Treaty of Verdun - When Louis the Pious died in 840, the Frankish Empire passed to his eldest son, Lothair I. This, however, did not sit well with Louis' other two surviving sons, Louis II and Charles the Bald. They refused to recognize Lothair's legitimacy as emperor and went to war with him almost immediately. Lothair's seat of power was in Italy, Louis II operated out of Bavaria (sometimes he is referred to as Louis the German), and Charles was in Aquitaine. In 841, Louis and Charles combined forces and defeated Lothair at the Battle of Fontenoy. 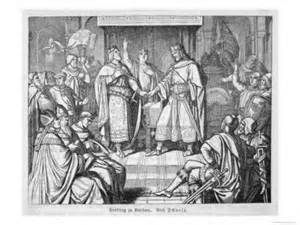 The would-be usurpers made their alliance official in 842 with the Oaths of Strasbourg. Those two events convinced Lothair to negotiate with his brothers. The result was the Treaty of Verdun. In 843, the Frankish Empire was divided into three kingdoms, essentially along the three brothers' seats of power. To Charles went the western region (roughly modern-day France) which became West Francia. Louis was given the eastern region (roughly modern-day Germany) which became East Francia. And the region in between (northern Italy up to the modern Benelux countries) went to Lothair and became Central Francia. Lothair was allowed to keep the title of emperor, while the other two became kings of their respective lands.